Indian classical dances are an ancient art form whose beginning can be traced to ‘Natya Ved’. It is based on Natya ved. Bharat has explained in detail the art of dance in Natya Shastra. Initially, the object of dance was only spiritual elevation and the performance was only to worship the God. Such dances were called ‘Margi’ dance. Additionally, another dance style was also common, called ‘Desi’ which was for public entertainment. ‘Margi’ and ‘Desi’ dances have evolved into today’s classical dance forms. Following is the brief description of important classical dances of India. Kathak is a word of Sanskrit language and it literally means story or story teller, one who reads aloud “Puranas’ i.e. “Kathakar” or “Kathavachak”. It is from the word Katha the word ‘Kathak’ developed and became popular which means a caste engaged in singing, playing instruments and dancing. Learned people have said ‘One who tells story is called Kathak’. It is evident that the dance Kathak relates to story (Katha) and the tradition of the story telling is quite ancient. Instances are found in Vedas, Puranas and other scriptures e.g. in the court of Lord Rama, the disciples of Sage Valmiki i.e. Lava and Kusha narrated the story of Lord Rama by singing and enacting the same. In fact, this dance form has its origin to the period of Lord Rama. The storytellers who followed this style were called Kushilava and later on called “Kathak’. Similarly, the story of Lord Krishna i.e. “Bhagvata” was narrated in the temples through songs and dances. In the medieval age, when large scale destruction of temples took place, these story tellers called ‘Kathak’ lost their shelter and began to scatter and found refuge in the courts of Kings or Nawabs and started creating dances according to their respective tastes and to establish themselves in the court, they innovated to create extraordinary effects. It is also believed that in the Muslim age, Kathak had to be totally transformed. Hindu culture was destroyed and Kathaks had to absorb the court’s pomp and show and sense of pleasure. In this age, Kathak style of dance emerged as a means of entertainment and sensual pleasure. In this age the “King” replaced the Lord and “Devdasis” became “Sakhi’. The dance imbibed Muslim literature, Ragas and Beats and poems like Ghazals. Thumri became subject of dance form. The dependence of Kathak dance on the court brought the artists (Gunijan) and the audience both closer to prostitutes as a result of which the standards of morality began to dilute. The system of “Gharanedari’ also developed around this time. The three houses of Kathak i.e. Lucknow, Jaipur and Benaras were founded. During the declining phase of Muslim rule, Nawab Wajid Ali Shah and thereafter Nawab Rampur, Raja Chakradhar Singh etc. made their contribution to keep this dance form alive but generally during the European age, this dance form almost became extinct. However, during last few decades, the attitude of society towards Kathak has undergone a change and with the establishment of music institutes, the image of Kathak has improved. As a result, boys and girls of cultured families were attracted to this dance form. Kathak is the classical dance form of Northern India. In the performance of Kathak, the artists enjoy a lot of freedom usually not available in other dance forms. Each Kathak dancer begins the dance in his or her unique way and organizes the performance according to his preference. However Kathak dance performance is usually divided in two parts: (1) Nrit and (2) emoting. Kathak begins with Nrit under which ‘Thath’, ‘Amad’, ‘Tode’, Tukde’, ‘Paran’ and ‘Tatkar’ are performed. Under emoting aspect, ‘GatNikas’, ‘Gatbhava’ and ‘Thumri Bhav’ or ’emoting a poem’ is performed. In Kathak dance, “Ghunghroos” are actually used in a unique manner. Each ‘Bol emanating from ‘Tabla’ and ‘Pakhavaj’ is matched by the dancer through the Ghunghroos. The spectacular aspect is performance of ‘Bhramris’. The costume of Kathak: Women usually wear Lehnga Choli and Dupatta while performing Kathak. Male dancers wear Churidar Paijama, Kurta and Angarkha and tie a Dupatta in the waist. Click here to read more about Kathak Classical Indian Dance. Bharat Natyam is a popular classical dance form of South India. It is related to Devdasis. For the beautiful expression and artistic presentation of Bharat Natyam, much credit goes to Devdasis. The teachers of Bharat Natyam called Nattuvan were considered to be Acharyas of this art. These Nattuvans used to train their female disciples free of charge. After training, their disciples used to earn and give a part of their earnings to their teachers. Bharat Natyam is considered famous for its spectacular speed and expressions through body movements. Allaripu: the dance begins with prayer rudra which is considered Allaripu. It is characterized by identical positioning of both sides of the body. Movement of neck, eyes, eyebrows is called ‘Rechak’ and movements of both sides of the body is identical. Jethiswaram: In the second stage the dance is accompanied with singing which is called Jethiswaram. Shabdam: In the third stage, prayer is offered to the Lord and the king is praised through poems. Varnam: In this stage ’emoting’ and ‘footwork’ reach their climax and the Nayika emotes some Shringaric story. Padam: The dancer emotes on poems in mid stage. Shlokam: By reciting shlokas in Sanskrit, prayers are offered to Lord Krishna. 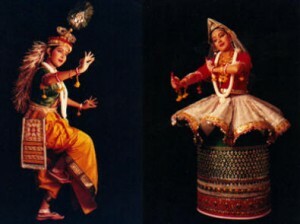 Costume of Bharat Natyam: The dancers wear tight dhoti (Langdar) in which an attractive dhoti with pleats is joined in the centre; which at the time of foot work spreads like peacock feathers between the legs. Pataka and kamarbandh add further attraction to the costume. Men usually wear a Pataka and Kanthi (a type of necklace) while women wear choli and special garlands. This dance is particularly popular in Kerala, a state in South India. It has a beautiful combination of music, story and emoting. In this dance form, ’emoting’ has dominance. The dance features stories of Ramayana, Mahabharat or any other mythological story. The actor playing the role comes on the stage and enacts according to the story while in the back ground, musical compositions are played to explain the Bhavas. Kathakali dance is characterized with the dominance of ‘Tandava’ element and Veerta (Bravery), Adbhut (spectacular) and Shant (peace) rasas are also established. The body movements are complex and the number of mudras also are many more than those found in other classical dance forms. In this style of dance, the Abhinay part is important. The dance begins with a prayer to God sung from behind the screen. Thereafter, the instrumentalists play together and male or female dancers come on the stage gradually and emote according to their roles through body movements. For example, if the role of Ravana is to be played then all the expressions will be that of Roudra or Bhayanak Ras (Anger). As a result the actor does not recite the dialogues like in a drama but emotes through facial expressions and body movements. Costume of Kathakali: In this dance costume designing and make up are of great importance. Characters wear tight jacket and colorful ghaghara (long skirt) which remains blown. They also wear a crown according to the role whose halo may stretch up to their feet. The color of the face is according to the role. The faces of gods are green, that of demons, red or black. Women and other minor actors have natural collogued face. The decoration and make up is according to Abhinaya. There is a folklore related to this dance that once when the Gopies (milkmaids) were engaged in dancing with Krishna in ‘Maharaas’ the Natraj Shiva sought permission to witness the same. Krishna permitted him to watch the performance but only with his back facing the dancers but Shiva was so enchanted with the dance, sound of Mrudangs, flute and ghungaroos that he forgot his promise and hiding himself watched the dance. He then returned to his abode in Himalayas and decided to perform the ‘Raas’ with his wife Parvati. For performing ‘Raas’, Shiva chose Manipur and invented instruments like ‘penga’ and ‘Pena’. Sheshnag (the king of serpents) lit up this area with the ‘mani’ in his hood and since then the region is known as ‘Manipur’. The dance having been influenced by ‘Maharaas’ describes mostly the playful acts of Krishna. This dance is usually performed by girls but men are not barred from performing it. In the Manipuri dances four types of Raaslilas are performed i.e. Vasant Raas (Raas of spring season), Maharaas (Raas of full moon day), Ktnj Raas (Raas of tree clusters) and Nitya Raas (Eternal Raas). This dance has a preponderance of ‘Lasya’ and the footwork, eyebrow movements, hand gestures and body postures all imbibe ‘Lasya’. Costume: The costume of Manipuri dance is extremely, attractive and colorful. The women dancers wear a costume called ‘Pulloi’ A loose lehanga of bright satin or silk is worn which is called ‘coomin’. It is adorned with motifs made with glass and Jari which is covered by transparent silk or peshwan. To blow the ‘coomin’ near the knees, bamboo sticks are placed inside in a circular form. The face of the dancer is covered with transparent silk. The hairs are raised and then tied in a knot. The shape of the knot is according to the type of Raas. The Gopis usually wear costume of red color while Radha wears green colour. The history of Kuchipudi dance is quite old but it was recognized as a classical dance much later. Its origin is placed around 2nd century BC. 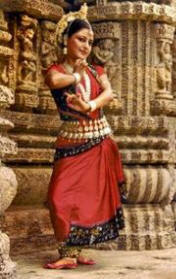 Since the dance evolved in the Kuchipudi region of Andhra Pradesh, it is known as Kuchipudi dance. It is a traditional dance drama which bears distinct influence of Vaishnav sect. This dance form is also influenced by Oddissi and Bharat Natyam dance styles. (a) Poorvarang : This is akin to Bhoomi puja (worshipping the earth) followed by prayers to Shiva, Vinayaka or Venkatcsh war. (b) Bhamakalapum : This is the second stage of the dance in which the dance is performed based on a story line. (c) Shabdam: The third stage of the dance is called shabdam in which a “word’ is expressed by emoting in various manners. (d) Dashavatar: In this stage all the ten incarnations of Lord Vishnu arc described. (e) Rama Paltabhishek : This is the fifth stage in which the story of Rama-right from his birth to ascendancy on the throne is described through the medium of dance. (f) Tillana : This is the 6th stage in which dance is performed through “Tillana” which is pure beats and laya. (g) Tarangani : Tarangam are the poems composed by Narayan Tirtha describing the childhood acts of Lord Krishna. In the end there is spectacular exhibition of ‘Layakari’ and ‘body movements’ which is performed by the dancer while standing in a Thali (plate). Costume: The women wear sari and blouse and use waist band. Women also wear an ornamental belt in the waist and arm bands, tika and necklace. Men usually wear a dhoti, waistband and Dupatta. Oddissi is one of the oldest classical dance forms of India. It was born in the temple of Lord Jagannath in Puri in the state of Orissa which was always the centre of art, literature and culture in the Eastern India. The dance evolved through devdasis in the temple called Mhari and the boys called ‘Geeti yuwan’ who danced in female dress. The dance begins with bowing to earth and prayer to’ Vighnaraj’ by singing ‘Mangalacharan’ and dancing on it. The second stage is ‘Batunritya’ which initially performed at slow pace using ‘Charis’, ‘Bhangimas’ and ‘Karans’ and is speeded up gradually. After Batunritya, prayers are offered to the Lord which are taken from Sanskrit or Oriya literature. Next stage is called ‘Pallavi’ in which Hastaks (hand gestures) are demonstrated according to the music. The performance is concluded with ‘Tarjan’ which is somewhat similar to Tarana of Kathak or Tillana of Bharatnatyam involving demonstration of ‘Swar’ ‘Tal’ and ‘Nrit” in which, pace is continuously increased and dance reaches its climax. Costume: The women wear silk sari with a ‘Lang’ whose spread hangs in the front. They wear a waistband of silver, most of the ornaments are made of silver the hair are arranged in a round knot and adorned with buds of pearls. According to some folklores, Lord Vishnu first performed ‘Mohini’ dance on the shores of Kerala and the same dance is popular in Kerala in some or other form and is known as ‘Mohiniattam’. The origin of this dance form is attributed to the devdasis of Tamilnadu combining with the Nagyars of Kerala. While the dance of devdasis had a preponderance of Lasya, the Nagyars were skilled in emoting through facial expressions and combination of the two skills led to development of Mohiniattam style of dance in the temples. In this dance there is a distinct importance of court songs and music. The dance is performed in the following sequence. First stage commences with ‘Cholketu’ in which the Lord is worshipped with prayers. It is followed by Taliswar Varnanam, Padm and Tillana. The dance is concluded with shlokam in a very interesting style. The shlokam are devotional in nature. 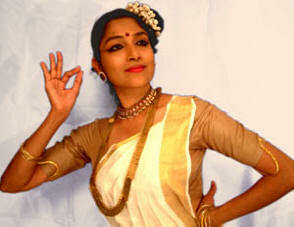 Costume: The female dancer usually wears a white sari with a broad red border. The sari is kept up to the calves. Hair are tied into a bun on the left side above the temple and further adorned with fresh fragrant flowers.